Could Nuts Reverse Memory Loss in Alzheimer's? Research: Could Nuts Improve Memory in Alzheimer's? Jon Boyes/Photographer's Choice RF/Getty Images. Alzheimer's disease, the most common type of dementia, is characterized by progressive memory loss, difficulty reasoning, declines in communication and overall confusion and disorientation. A handful of medications have been approved by the Food and Drug Administration (FDA) to treat the disease, but their effectiveness is very limited. So, what else can we do? How can we fight Alzheimer's disease? Along with physical exercise and mental activity, research has increasingly been looking at our diet and asking which foods are correlated with a decreased risk of dementia. Answer? Nuts, along with several others. Young healthy college students demonstrated improved inferential reasoning (the ability to draw conclusions—or make inferences) after consuming a half of a cup of walnuts for a period of 8 weeks. In a large, six-year study, eating walnuts was associated with improved working memory in older adults. Eating different kinds of nuts has been correlated with a strengthening of brainwave frequencies associated with memory, learning and other cognitive tasks. This study included walnuts, almonds, peanuts, pecans, pistachios and cashews. 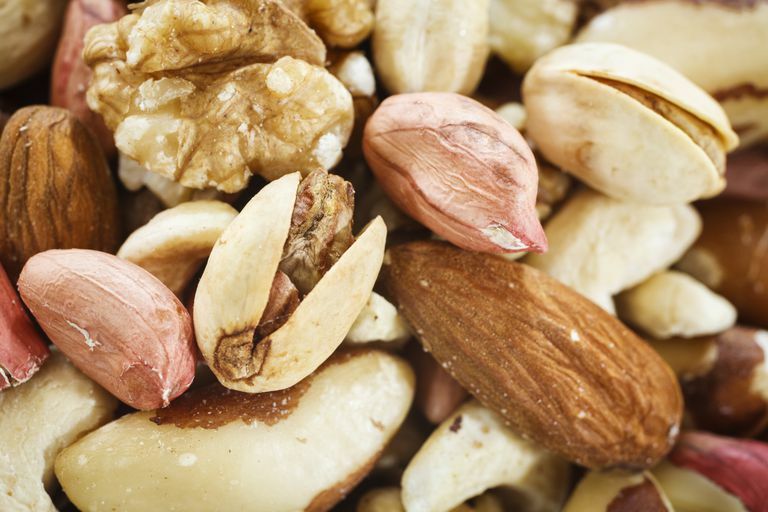 Another research study found that women whose long-term diets contained more nuts performed higher on cognitive tests. The study's authors note that the improvement between those who ate nuts and those who didn't is equivalent to the difference between the functioning of women who are about two years apart. In other words, eating nuts was connected with older women's brains being able to function as if they were two years younger. Walnut extract showed the ability to protect against cell death in the brains of rats. Rats which were fed a diet that included walnuts demonstrated an ability to reduce the buildup of proteins in the brains which can interfere with healthy cognition. The buildup of excess proteins in the brain is one of the hallmarks of Alzheimer's disease. One study evaluated the effect of almond paste on rats' cognitive abilities. Both learning and memory improved for the animals who were fed the almond paste, compared to the mice who were not given it. Can Eating Nuts Reverse Alzheimer's and Dementia? Is it possible that eating nuts can help reverse cognitive loss symptoms that are already present? One study conducted with mice bred to develop a form of Alzheimer's disease seems to suggest this possibility. While the study was conducted using mice and not human subjects, research using mice often helps us understand how the human brain works. Some studies with mice have been replicated in humans and have achieved similar results, although it's important to note that this does not always hold true. In this study, the mice with Alzheimer's disease developed memory loss, spatial disorientation, physical motor declines, anxious behaviors and a decreased ability to learn—all symptoms of Alzheimer's disease. They were divided into three groups; one was fed a typical diet, a second group was given a diet that contained 6% walnuts and a third group was fed a diet with 9% walnuts. How much is this for humans? According to the authors of the study, this would be equivalent to about 1- 1.5 oz. of walnuts daily for us. The mice were fed these diets beginning at 4 months and then were tested approximately 9-10 months later. Tests included measures of motor coordination, learning ability, memory and anxious behavior. The mice who were fed the diets containing 6% and 9% of walnuts demonstrated significant improvement in all areas tested. There was no difference between the mice who ate the 6% and 9% walnuts. Mice with Alzheimer's disease typically should decline over time in multiple areas, and yet at the end of the study, the mice who were fed the walnut diet performed similarly to the mice who did not have Alzheimer's disease. Several research studies have shown a connection between improved brain health, cognitive functioning and eating nuts. Nuts are also a component of the Mediterranean diet and the MIND diet, both of which have demonstrated a correlation with improved brain health and functioning. Finally, nuts have also been associated with several other health benefits such as heart health and lower cholesterol levels, so feel free to enjoy them! Berk, L, Lohman, E, Bains, G, et al. The FASEB Journal 2017 31:1_supplement, 636.24-636.24. Nuts and Brain Health: Nuts Increase EEG Power Spectral Density (μV&[sup2]) for Delta Frequency (1–3Hz) and Gamma Frequency (31–40 Hz) Associated with Deep Meditation, Empathy, Healing, as well as Neural Synchronization, Enhanced Cognitive Processing, Recall, and Memory All Beneficial For Brain Health. Cinnamon- Tasty and Good for Your Brain? Is Deep Brain Stimulation Effective in Treating Alzheimer's?